Anne Askew received a good education from home tutors. When she was fifteen her family forced her to marry Thomas Kyme. Anne rebelled against her husband by refusing to adopt his surname. The couple also argued about religion. Anne was a supporter of Martin Luther, while her husband was a Catholic. In 1544 Askew decided to travel to London to meet Henry VIII and request a divorce from her husband. This was denied and documents show that a spy was assigned to keep a close watch on her behaviour. She made contact with Joan Bocher, a leading figure in the Anabaptists. In March 1545 Askew was arrested on suspicion of heresy. She was questioned about a book she was carrying that had been written by John Frith, a Protestant priest who had been burnt for heresy in 1533, for claiming that neither purgatory nor transubstantiation could be proven by Holy Scriptures. She was interviewed by Edmund Bonner, the Bishop of London. After a great deal of debate Askew recanted and was released and sent back to her husband. However, when she arrived back in Lincolnshire she went to live with her brother, Sir Francis Askew. In May 1546 Henry gave permission for twenty-three people suspected of heresy to be arrested. This included Anne Askew. Stephen Gardiner selected Askew because he believed she was associated with Henry's sixth wife, Catherine Parr. Catherine also criticised legislation that had been passed in May 1543 that had declared that the "lower sort" did not benefit from studying the Bible in English. The Act for the Advancement of the True Religion stated that "no women nor artificers, journeymen, serving men of the degree of yeomen or under husbandmen nor labourers" could in future read the Bible "privately or openly". Later, a clause was added that did allow any noble or gentlewoman to read the Bible, this activity must take place "to themselves alone and not to others". Catherine ignored this "by holding study among her ladies for the scriptures and listening to sermons of an evangelical nature". After being tortured on the rack by Lord Chancellor Thomas Wriothesley and his assistant, Richard Rich, she was burnt on the stake at Smithfield on 16th July 1546. Anne Askew, this brave, cool, and very intelligent young gentlewoman... the daughter of Sir William Askew of Lincolnshire, had married Master Kyme, a Lincolnshire gentleman; but he had strongly objected to the Protestant doctrines which she advocated, and turned her out of his house. She came to London, and distributed illegal Protestant books. She had contacts at court with some of the most eminent ladies there - some said with the Queen herself. In March 1545 she was arrested, and examined by Bonner; but he was impressed by her intelligence and good manners, and he and other officials made it easy for her to recant. Lord Chancellor Wriothesley was in charge of the interrogation, and he saw this chance as another to incriminate the Queen. When Anne Askew proved obdurate, he ordered her to be put on the rack, and, with Sir Richard Rich, personally conducted the examination. Anne Askew later dictated an account of the proceedings, in which she testified to being questioned as to whether she knew anything about the beliefs of the ladies of the Queen's household. She replied that she knew nothing. It was put to her that she had received gifts from these ladies, but she denied it. For her obstinacy, she was racked for a long time, but bravely refused to cry out, and when she swooned with the pain, the Lord Chancellor himself brought her round, and with his own hands turned the wheels of the machine, Rich assisting. Afterwards, Anne's broken body was laid on the bare floor, and Wriothesley sat there for two hours longer, questioning her about her heresy and her suspected involvement with the royal household. All in vain. Anne refused to deny her Protestant faith, and would not or could not implicate anyone near the Queen. 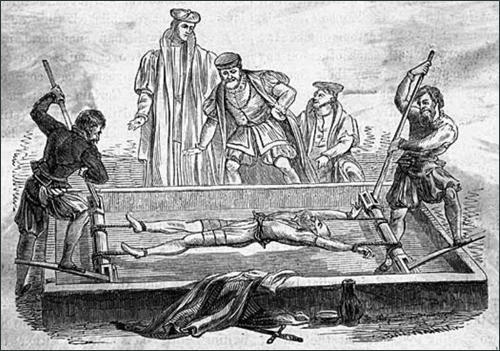 (Source 6) Heretic being tortured on the rack in the Tower of London. Then they did put me on the rack, because I confessed no ladies or gentlemen, to be of my opinion... the Lord Chancellor and Master Rich took pains to rack me with their own hands, till I was nearly dead. I fainted... and then they recovered me again. After that I sat two long hours arguing with the Lord Chancellor, upon the bare floor... With many flattering words, he tried to persuade me to leave my opinion... I said that I would rather die than break my faith. Hitherto we have treated of this good woman: now it remaineth that we touch somewhat as concerning her end and martyrdom. After that she (being born of such stock and kindred that she might have lived in great wealth and prosperity, if she would rather have followed the world than Christ) now had been so tormented, that she could neither live long in so great distress, neither yet by her adversaries be suffered to die in secret, the day of her execution being appointed, she was brought into Smithfield in a chair, because she could not go on her feet, by means of her great torments. When she was brought unto the stake, she was tied by the middle with a chain, that held up her body. When all things were thus prepared to the fire, Dr. Shaxton, who was then appointed to preach, began his sermon. Anne Askew, hearing and answering again unto him, where he said well, confirmed the same; where he said amiss, "There," said she, "he misseth, and speaketh without the book." The sermon being finished, the martyrs, standing there tied at three several stakes ready to their martyrdom, began their prayers. The multitude and concourse of the people was exceeding; the place where they stood being railed about to keep out the press. Upon the bench under St. Bartholomew's church sat Wriothesley, chancellor of England; the old duke of Norfolk, the old earl of Bedford, the lord mayor, with divers others. Before the fire should be set unto them, one of the bench, hearing that they had gunpowder about them, and being alarmed lest the faggots, by strength of the gunpowder, would come flying about their ears, began to be afraid: but the earl of Bedford, declaring unto him how the gunpowder was not laid under the faggots, but only about their bodies, to rid them out of their pain, which having vent, there was no danger to them of the faggots, so diminished that fear. On 18th June, she (Anne Askew) was arraigned at the Guildhall in London, and sentenced to death. She was burned at the stake on 16th July at Smithfield, along with John Lascelles, another Protestant... Anne died bravely and quickly: the bag of gunpowder hung about her neck by a humane executioner to facilitate a quick end exploded almost immediately. On 15 July she was brought to Smithfield for burning, but she had been so broken by the rack that she could not stand. She was tied to the stake, and the faggots were lit. Rain and thunder marked these proceedings, whereupon one spectator called out: 'A vengeance on you all that thus doth burn Christ's member'. At which remark a Catholic carter struck him down. The differences of faith among the people were clear enough. Throughout his reign Henry had periodically displayed a compulsive need to demonstrate that he was in charge, and his brinkmanship over Cranmer's arrest may have been another example of that unlovable trait. If so, then the conservative position may have been less damaged by the debacle than appeared. In 1545 a Yorkshire gentlewoman named Anne Askew was arrested on suspicion of being a sacramentary. Her views were extreme, and pugnaciously expressed, so she would probably have ended at the stake in any case but her status gave her a particular value to the orthodox. This was greatly enhanced in the following year by the arrest of Dr Edward Crome, who, under interrogation, implicated a number of other people, both at court and in the City of London. Anne had been part of the same network, and she was now tortured for the purpose of establishing her links with the circle about the Queen, particularly Lady Denny and the Countess of Hertford. She died without revealing much of consequence, beyond the fact that she was personally known to a number of Catherine's companions, who had expressed sympathy for her plight. The Queen meanwhile continued to discuss theology, piety and the right use the bible, both with her friends and also with her husband. This was a practice, which she had established in the early days of their marriage, and Henry had always allowed her a great deal of latitude, tolerating from her, it was said, opinions which no one else dared to utter. In taking advantage of this indulgence to urge further measures of reform, she presented her enemies with an opening. Irritated by her performance on one occasion, the King complained to Gardiner about the unseemliness of being lectured by his wife. This was a heaven-sent opportunity, and undeterred by his previous failures, the bishop hastened to agree, adding that, if the King would give him permission he would produce such evidence that, "his majesty would easily perceive how perilous a matter it is to cherish a serpent within his own bosom". Henry gave his consent, as he had done to the arrest of Cranmer, articles were produced and a plan was drawn up for Catherine's arrest, the search of her chambers, and the laying of charges against at least three of her privy chamber. Question 1: Study source 1. Why do you think that it was painted a long time after Anne Askew's death? Question 2: Read the introduction and sources 2 and 3. Explain why Anne Askew was arrested in 1545. Question 3: Read the introduction and source 4. 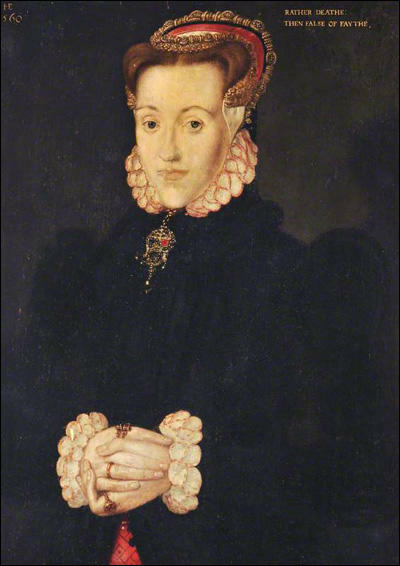 What does the historian Alison Plowden mean when she says: "Bishop Gardiner and his ally on the Council, the Lord Chancellor Thomas Wriothesley, planned to attack the Queen Catherine Parr through her ladies and believed they possessed a valuable weapon in the person of Anne Kyme, better known by her maiden name of Anne Askew." Question 4: Read sources 5 and 7 and describe what is going on in source 6. 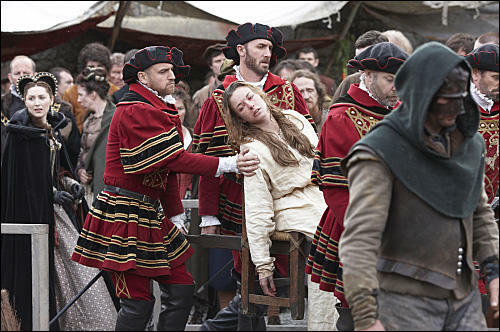 Question 5: Why was Anne Askew tortured? Question 6: After reading sources 9, 11, 12 and 13, explain what is going on in sources 8, 10 and 14.